With all the talk and media attention about phallic posts, the city to our north has quietly added Salem's old downtown planters to a new park. If you pay taxes to the city of Keizer, you will be happy to know that they didn't pay anything for them. Keizer Rapids Park at the end of Chemawa Road west of River Road, is the new home for our old friends. 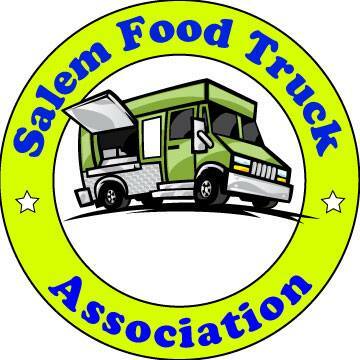 The 119 acre park along the Willamette River is a far cry from the hustle and bustle of downtown Salem streets. They seem out of place and pathetic lined up, and empty, along the driveway of a neighboring property. Maybe Keizer is thinking ahead to 2009 when smoking is prohibited in bars and smokers will be wandering around town looking for ash trays. They could start an ad campaign to attract nicotine addicted Oregonians to the states' first smoker friendly park. Here's my suggestion for the billboards: Keizer, We Want Your Butts. Just imagine how great that would be for business. 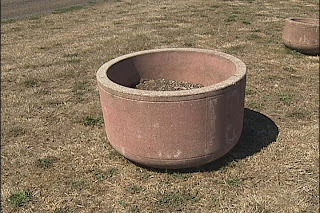 My worry is that the folks in Keizer will look at their new planter/ash trays and it will remind them of something unholy and they will demand that the city apply collars around them and chain them together. I think Salem should have kept a few of these planters to be placed in trouble spots around town. They could put one or two near the road next to that house that you drive all the way around on Madrona Ave. South. Then they could get rid of that awful rock that they poured red paint all over. How about putting them over the really big cracks in our sidewalks warning pedestrians of impending dangers. What if they put them downtown in front of the bars and just used them as ash trays. You gotta hand it to Keizer, for seeing the potential in the pots. One man's trash is another's treasure. Coming soon to this blog, Eat Salem looks into the rumor that Keizer's new water tower will be painted like a hot air balloon and become a billboard for Re/Max.